Posted on April 12, 2018 at 5:34 am. We begin today with WOLF PACK PRIDE!! 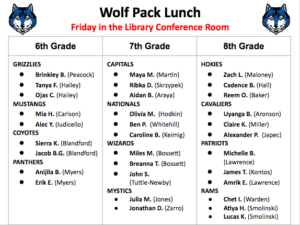 The 3rd Quarter just ended — and that means it’s time for our quarterly tradition: the Wolf Pack Lunch! It’s a free pizza party to recognize those students who embody all the best that Williamsburg has to offer. It’s also a chance for students to talk one-on-one with our administrators, and to share their thoughts and concerns about the school. The Track Team travels to Jefferson Middle School TODAY for their next meet at 3:15. So let’s root them on to victory and Be a Part of the Pride!! And now for an important Technology Tip from Ms. Solomon: All students, LISTEN UP!!! Do NOT upgrade your iPads at home to iOS 11.3. Again — DON’T upgrade your iPad with the new operating system. It has NOT been approved by APS. ONLY proceed with upgrades when specifically instructed, or else we may have to WIPE your device. See Ms. Solomon with any questions. Need help with Spanish? The Yorktown Spanish Honor Society will be offering the FINAL free tutoring session of the year — next TUESDAY during ASP 2 in room WW 5. Get extra help with grammar and vocab — and everything you need to succeed. Just be sure to sign up with your Spanish teacher in advance, or see Senora Stewart with any questions. Hasta pronto! “Every HERO needs a squad! !” The WMS Check-In Program is holding a big fundraiser this month — Pennies for Patients. This national campaign benefits the Leukemia & Lymphoma Society, which is working to find a cure for blood cancer. Pennies for Patients will run for the next 3-weeks, with the goal of raising 3,600-dollars. And here’s a little extra motivation for you: whichever TA collects the most money will get a free pizza and ice cream party!! See Ms. Kia with any questions, and contribute to Pennies for Patients TODAY! The Check-In Program will ALSO be selling CANDY after school everyday this week — culminating with a BAKE SALE this FRIDAY. All money raised will be added to the Pennies for Patients fundraiser and its goal to cure cancer. So be sure to come by, get a sweet treat, and support Pennies for Patients! –and Lauren M. from Mr. Luengo’s TA. Congratulations to all of our winners! Be sure to stop by the Library today to claim your prize. And now — it’s time for today’s trivia question: What genre of literature is the most popular at WMS? Graphic Novel, Realistic, Sci Fi Fantasy, or Mystery? To submit your answer, just go to the LIBRARY section of the WMS website and click “Research Links.” Or, follow the link in today’s Morning Announcements Blog. Good Luck, Wolves! !